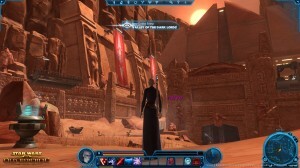 Home » Posts Tagged "Datacron"
This guide takes you from creating your character to the point where you are ready to pick your advanced class in an expedited manner, without skipping content. 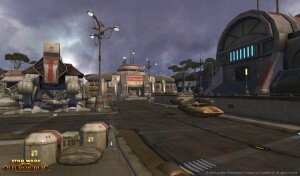 It leads a new Bounty Hunter or Imperial Agent through the newbie zone on Hutta, including the heroic quests. This is not a step-by-step guide. I will only point out the general direction and key moments in the storyline. You arrive here to get your class quest started. You are also given two side quests. Bind at the entrance of the cantina and activate the taxi stand. 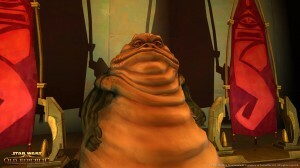 Finish those quests, pickup and finish the 3rd side quest before you head to Nem’ro’s Palace. Follow your class quest line and pick up another side quest. They’ll both lead you to the Evokii Work Camp. 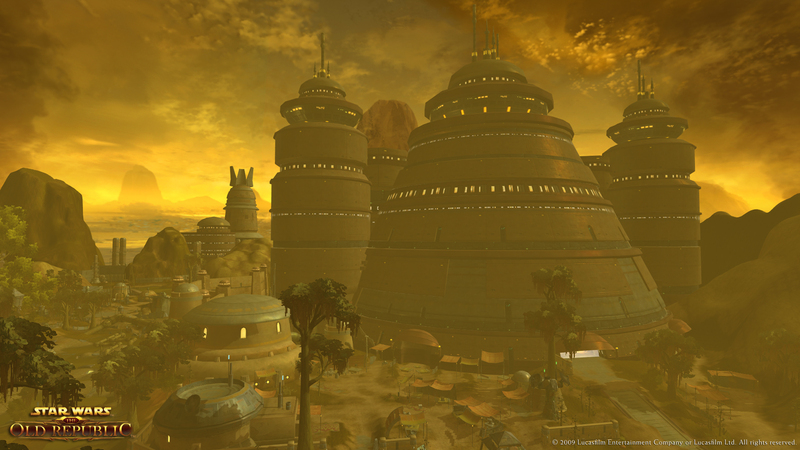 As you leave Nem’ro’s Palace, you’ll see Nem’ro’s Bazaar to your right, which is the vendor and trainer area. Side quests should point you to your trainers. Perhaps you repair equipment and sell off the vendor trash in your bags as well. On your way to the work camp, you’ll pass the bind point and taxi stand for Nem’ro’s Bazaar. Along the path to the work camp, you will see a few animals. Shoot at least one of each species for the lore entries and the extra XP that comes with them. At the work camp you pick up another side quest and your first heroic quest. Here’s also a stop for the Imperial Agent class quests. The quests will lead you further south into an Evokii village, where you will find another side quest on a holopad. Don’t forget the to touch the Evokii totem, a lore object. Continue south past the village. 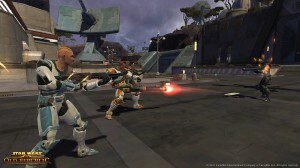 There you’ll find a level 5 Champion droid. You will need help to kill him. Finish the “Tech Jealousy” quest in this area. On the north side of the swamp is a toppled silo. Climb it and continue over the hill to your first datacron ( aim+2, location= -100,860). Jump down, continue north and finish “Trophy Hunter”. Leave the work camp, turn south and follow the wall eastward. You’ll see another Evokii village with a totem lore object for more XP. Turn back a bit and move north through the wall. There’s another bind point and a side quest, which will lead you further north. Remember you’ll have to jump onto the boxes to get to the quest object. Don’t turn in the quest just yet. Continue north instead along the left side of the river. You’ll find a holopad for another quest. Kill chemilizards for the bonus quest. The head back south to location (-75,400) to kill a Wookie. Continue south and turn in your quests. Use your fast travel to return to Nem’ro’s Palace. As usual, turn in your side quests and continue your class quest, eventually picking up 2 more side quests. Don’t forget to train. Then head for Nem’ro’s Bazaar taxi stand and continue to the location for “To Boom or not to Boom”. After that, you should see another heroic quest (location=0,200) on your way to the Rustyards. Hand in the quest that brought you here, pick up two new ones, bind and register at the taxi stand. Then head north through the nearby gate and take a walk around the factory buildings, picking up quest objects and bonus quests. Ignore the stops for heroic quests. This route will also lead to all generators that need to be disabled for the Bounty Hunter class quest. At the north side of this route (location=500,0) you’ll see pipes leading out to the water and onto an island. 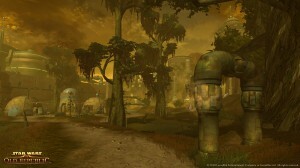 Hop on those pipes and follow them to the next datacron (presence+2) on the island. When you return, finish your tour around the factory and enter it from the south. Insite the complex head upstairs first. The remaining quests are straight forward and you can return to the Rustyards hub using your fast travel option. After turning in your quests head to Nem’ro’s Palace using the taxi. Again, turn in your quests and move the class quest forward. The class quest will send you into Fa’athra’s Palace. On your way out, pick up a side quest. See your trainer and get another side quest on the east wall of the bazaar. From here, take the taxi to the Chemical Marsh. Pick up yet another side quest on your way to the Palace. Bounty Hunters will have a bonus quest to collect bounties for some named Lieutenants located in the area outside the palace. Enter the palace and use the lore tag right at the entrance. The questing within the palace is straight forward including the class quests. Make sure you don’t forget Fa’athra’s stash after you’ve freed Oren Ward. There’s also a lore carbonite block next to Oren Ward’s. And to top it off, there’s a good chance to find a security chest in both rooms neighboring this one. Fa’athra’s stash may or may not be guarded by Gajoru the Vault Guardian, an elite, for additional loot. Once done with the palace, use your fast travel option to the Chemical Marsh for the first turn in, then continue to Nem’ro’s Palace. 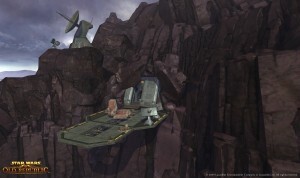 Turn in your side quests and wrap up the class quest, including a trip to the space port. Head back to the bazaar for the lore object quest coming with your customizable weapon. Finally see your trainer, either in the bazaar or even at the fleet to pick your advanced class. Return for the heroic quests. Head for the sewer entrance to do “Factory Recall”. Once inside the sewers, you can go straight for an champion droid, a security chest and a datacron (blue matrix shard, location=-25,320). You should have sabotaged the boxes by now and can leave through the other exit. Factory recall continues in the next building. Make sure you go to the second floor for a security box at the end of the balcony. Hand in your quest and go to the location for “The Man with the Steel Voice”. That quest isn’t hard at all, but it leads you to “Hostage Situation”, which starts a bit to the west of it. Hostage Situation will eventually lead to the basement of the Muckworks, where you have to kill a champion guard for some bonus loot. Part 2 leads you to the roof, to blow up the first Evokii space ship. You’ll have to defeat Baranj, the Starseeker (champion) first. Turn in your quests and head for the space port. Once you have turned in your last heroic quest at the Evokii camp, you can follow the road from the Evokii camp east until you cross a bridge. To the left on a wall is the final Evokii lore totem. Some closing remarks: don’t obsess over gear. It’s not worth your time to grind for that 8th commendation to get your blue chest piece. By the time you are 13, you’ll have it replaced already. Similarily, don’t buy any gear from the vendors. What you get through quests is good enough for the zone and will last you for a while on Dromund Kaas as well.